The movie starts. 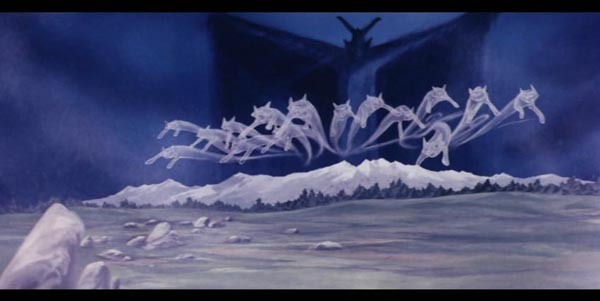 The Toei logo fades to a windswept landscape and a wordless struggle between a boy and a pack of wolves; no soundtrack, no dialogue, just panting and grunts and the whistle of a thrown hatchet whirling around on its thong, knocking wolves for a loop, an orchestrated piece of desperate, synchronized violence that immediately tells the audience they aren’t in fairytale land. This land belongs to the Prince Of the Sun, Horus. 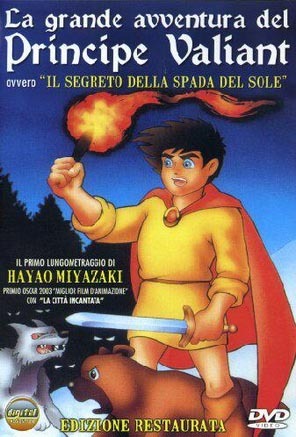 太陽の王子 ホルスの大冒険, "Taiyou no Ōji Horusuno Daibōken" aka Little Norse Prince aka Horus, Prince Of the Sun is not only a great film and a groundbreaking piece of animation involving darn near everybody who ever made a Japanese cartoon you liked, it’s also a prehistorical race-memory flashback from a time when civilization was nothing more than scattered villages of hunter-gatherers, iron the wonder technology of the age, and agriculture the disruptive new startup; when the forces of nature itself are the enemies mankind must unite and conquer. This is a movie about killing winter and bringing back spring, and if that’s not something we can all get behind (especially after last winter!) I don’t know what is. Horus is also the source, the Rosetta Stone, the Ur-text for what would make Japanese animation an international phenomenon, moving past storybooks and toy ads to become appealing, boundary-pushing films striving against the medium’s stereotypes. Most of what made Japanese animation tops for the next forty years - the yodelly pleasures of Heidi and other World Masterpieces, the dashing Lupin III of Cagliostro, the global, Oscar-winning brand that Ghibli would become, and a raft of Pokemon designers and super robot animators and Rocky Chuck supervisors –they all passed through the eye of Horus. The on-screen drama reflected the behind-the-scenes struggles of Toei animators battling their own studio, which would bury the finished product after only ten days in the cinema. Rescued from obscurity by a generation of devoted fans, the film would reach a worldwide audience almost in spite of its parent corporation. And now, after decades of scratchy prints and pan & scan dubs, Horus is finally a legit North American DVD release in a package that presents a terrific movie in tandem with enlightening amounts of context and background. But back to 1000 BC. Our heroic hatchet-boy Horus – we’re pretty sure what the screenwriters and the voice actors were going for was “Hols”, but “Horus” is what Toei wants to run with, so “Horus” it is – Horus here is the Mk 1 version of the Anime Boy Hero we’ll later see piloting giant robots, rescuing girls from flying castles, and surviving both tsunamis and industrial fascist plots with a strong right arm and a gleam in his eye. His struggle with the wolves is interrupted by the film’s sharp left turn into fantasy; the awakening of the rock giant Maug, from whose rocky shoulder Horus pulls a rusty but impressive sword, Aesop’s Fables style. Reforged, sharpened, and wielded properly, Maug tells Horus this sword will make him the Prince Of The Sun. Cue title. The next ninety minutes deliver the full, unchanging panoply of human experience; tragedy, desire, friendship, deceit, betrayal, bravery, regret, heartbreak, perseverance, vengeance, fellowship. An orphaned Horus sets sail to leave his solitary life and enter the world his father abandoned; to battle the winter elemental Grunwald himself with his axe and, if he can reforge it, the Sword. Along the way he’ll fight wolves, rats, and a giant monster pike, confront trickery and self-doubt, and learn that only the strength of an entire community can enable mankind to survive the elements and perhaps finish an exhaustingly ambitious animated film. Found wandering in ruins, the cursed Hilda and her beautiful songs distract the village and serve the venal purposes of the egg-stealing Drago, who has the ear of the weak-willed headman. Will the village survive bearing the full force of the Grunwald’s divide-and-conquer attempt to destroy humanity? His rats are coming; his wolves are already here. Crippled by her pain and cursed by her fear, Hilda fights her own internal battle; and her scornful remark to Horus, trapped in his own forest of doubt, may instead the key that frees them all. We learn through struggle and fire that working together, men can fight monsters, and that even the damned can find humanity through acts of mercy. The film climaxes with an astounding sequence involving ice mastodons, flaming towers, and the white-hot reforged Sword Of The Sun sliding onto the ice, ready for Horus, soaring skyward on a ghost-wolf to do battle with the Grunwald himself, a stirring moment of cinema that may just transcend culture, language, space and time itself. A sprawling, bold work, Horus is nothing less than a masterpiece. Pop anthropology aside, the film is an artistic triumph; but cinematic victory would prove Pyrrhic. Visually, Horus transformed Japan’s animation aesthetic, moving from the 50s superflat commercial-art style of earlier Yasuji Mori/ Yoichi Kotabe joints like Gulliver’s Space Journey or Little Prince & The Eight Headed Dragon, towards the more naturalistic, expressive characters we’d see everywhere later. Traditional cartoon kids and talking animal friends mingle with rough-hewn warriors and rock men while the Grunwald’s simpler design marks him as heir to Disney’s “Night On Bald Mountain”. 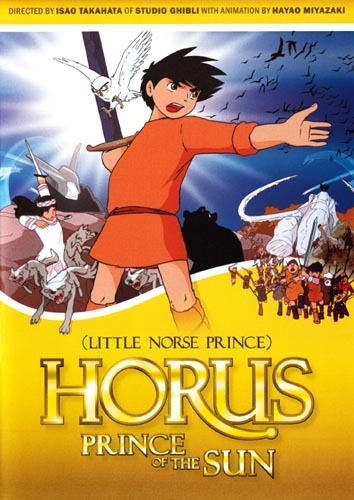 Horus features technical callbacks to films as disparate as Walt’s Pinocchio and Grimault’s The King And The Mockingbird, and also reflects earlier Toei works including the offbeat Jack & The Witch, as loners with only animals for friends are intrigued & betrayed by girls in thrall to evil powers, finding themselves trapped in weird psychoanalytical dimensions. The screenplay for Horus was taken from Kazuo Fukazawa’s puppet play “Chikisani No Taiyo”, in turn based on “Okikurumi To Akuma No Ko”, a song-poem epic from the Yukar, the oral tradition of the vanishing Ainu peoples of Hokkaido. This deep-cut ethnicity would be blurred and vaguely Nordicized for a potential international audience. Admittedly, the culture of Horus could be of any early Iron Age village within spitting distance of the Arctic Circle; the landscape becomes a character in its own right, filled with desolate, almost post-apocalyptic vistas and abandoned, overgrown settlements. 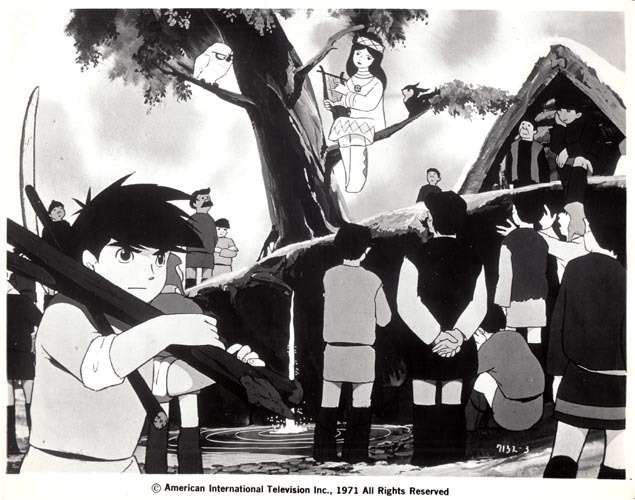 However, echoes of the Ainu can be seen in many places in the film, particularly in Hilda’s costume design. The film’s underlying themes of strength through unity are universal enough, and laid over almost primal myths of seasonal change and rebirth, Horus becomes a story as old as man itself. Director Takahata paid for the labor disputes, the cost, and the late delivery of Horus with a demotion from the feature film department. He, Miyazaki and other Horus veterans would leave Toei entirely in ’71, but Toei’s loss was the animation world’s gain. 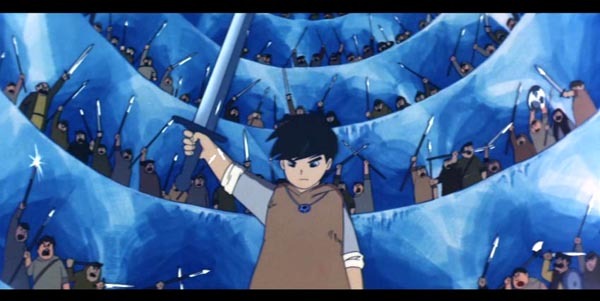 The key collaborative team for Horus was an all-star anime team, including first-time direction by Isao “Grave Of The Fireflies” Takahata, Yasuo “Puss In Boots” Otsuka as animation director, key animation by some guy named Hayao Miyazaki and Yasuji “Future Boy Conan” Mori, Reiko “Taro The Dragon Boy, Belladonna” Okuyama, and Yoichi “30,000 Leagues In Search Of Mother” Kotabe. These remarkable talents would go on to produce masterpieces for studios like Zuiyo Eizo, Nippon Animation, Top Craft, and eventually Ghibli. Was Toei chastened by the collectivist pro-labor subtext of Horus? Weirded out by the scene where Horus flies around Grunwald on a ghost wolf while a giant rock-man battles an ice elephant? Who knows. All we know is after Toei buried Horus with a mere 10-day theatrical release, the movie achieved certifiable cult status, living on in the hearts of nascent otaku who’d champion it for years to come in fanzines and magazine articles. Internationally the film was a slow starter, hampered by Toei’s official disinterest and confusing insistence in giving the film the English title “Little Norse Prince Valiant”, which conflates this film with the Hal Foster Arthurian-legend comic strip. American International would license the film for American television in 1971, titled “Little Norse Prince”. The Fred Ladd-directed dub features an all-star 60s anime cast including Billie Lou “Kimba” Watt, Corinne “Trixie” Orr, Gilbert “Superbook” Mack, and Ray “Gigantor” Owens. American fans made do with off-air copies of the AIP pan & scan television print until a Japan-only LD release in 1995. British media firm Optimum released a R2 DVD of the film in 2010, with English subs only. In contrast, Discotek’s current Horus DVD release is all-inclusive and essential. The print is flawless and includes the original Japanese soundtrack and the AIP dub. Special features abound; Mike“Anime Jump” Toole’s commentary includes interesting details about the Disney-like ambitions of Hiroshi Okawa and a great story of the time Miyazaki and Takahata danced together. Daniel Thomas Macinnes aptly praises Horus as “the Citizen Kane of anime.” There’s footage of a fascinating French TV interview with Takahata from 1995, a production art gallery, the original Japanese trailer, a Yoichi Kotabe interview detailing their real-life research, and a slideshow feature demonstrating both the inspiration Horus took from earlier films and later works that would be influenced by Horus. The invaluable Benjamin Ettinger delivers an essay about Reiko Okuyama, pioneering female Horus key animator who key-animated her husband’s directorial debut, Flying Phantom Ship. Everyone should own Horus, Prince Of The Sun, and I say that without reservation or qualification. The reason we’re even watching Japanese animation on this side of the Pacific is its ability to transcend national borders and to speak to people on a basic human level, and Horus is one of the best examples of the medium’s universal appeal. Japanese animation of this vintage isn’t often awarded this degree of respect here in North America, and as anime fans we should support these efforts. But beyond mere fandom or even the appeal of animation in general, Horus succeeds as a work of cinema that should be celebrated by all who love film for its own sake. Toei would never again be as bold as it was with Horus, Prince Of The Sun, and even decades later, the sweat and struggle of Takahata, Otsuka, Miyazaki, and their comrades continue to reward us all. Glad to see you tackled this masterpiece and gave it the dignity it deserved (and not sponsored by a fast food chain in your hometown, as it did when the AIP dub made it's 70's rounds, I think you can still watch that on Hulu if you bother). Some interesting information here! It's amazing what Discotek is doing for vintage anime fans (very happy about that <3). Much thanks for the kind words on Horus. I worked very, very hard on this DVD project, recording an audio commentary at 4:00am just before final deadline, writing and editing the English subtitles (of which I'm very proud), writing a couple lengthy essays, and editing two or three essays by other authors. I also argued strongly for the inclusion of the Japanese title "Horus, Prince of the Sun"; Toei wanted Discotek to only use that insipid "Widdle Pwince Schnooky Wookums" instead, for reasons that make sense to absolutely no one. Ah, well. This movie was always an eternal struggle, right? I was happy to earn a few bruised knuckles of my own in service of the good fight. If you don't mind, I'd like to use snippets of your essay for a quick project I'm working on this week (while also finishing a couple book manuscripts). It's an excellent review and includes many good details. Thanks again! Daniel, please feel free to quote as much as you like. Thanks for your hard work, and I'm glad you liked my review. I'm sorry but you wins the interwebz, Daniel! That was TOO good!